A healthy, delicious salad that is anything but boring. Prep the bacon and hard boiled egg in advance for an easy weeknight meal. Who doesn’t love eating salads in the summer months? They are easy to throw together, need minimal clean up, and leave you feeling great, which is especially important when you know you’ll be wearing a swimsuit soon! A cobb salad can be made to your liking. Want more protein? Add grilled chicken or shrimp, some ham or turkey – whatever you desire! When I know I’ll be having a Cobb salad, I like to meal prep a few ingredients ahead of time. The hard boiled egg and bacon can be made in advanced and stored in the fridge until you’re ready! 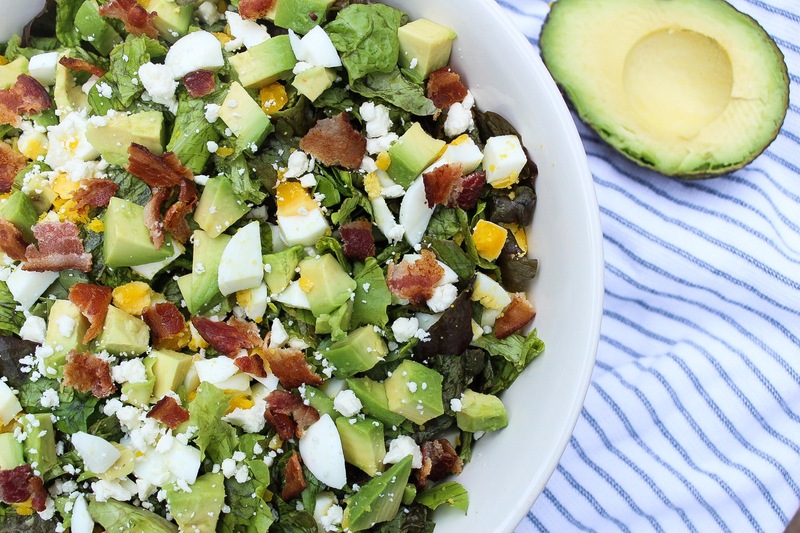 Top with hard boiled eggs, bacon, avocado, and feta cheese. Stir together. Finish with your dressing of choice.